ROGERS, Ark. – Some days, extension forester Tamara Walkingstick heads into the woods with a helmet and chainsaw. On May 7, her toolkit will consist of a recipe book and a toaster oven. To accomplish that, Walkingstick will lead a workshop from 10 a.m. to 2 p.m. May 7 at the Hobbs State Park visitors center east of Rogers near the intersection of Highway 12 and War Eagle Road. The class is limited to 25 people and costs $15 per person payable by check or cash at the site. Reservations must be made by calling 479- 789-5000. 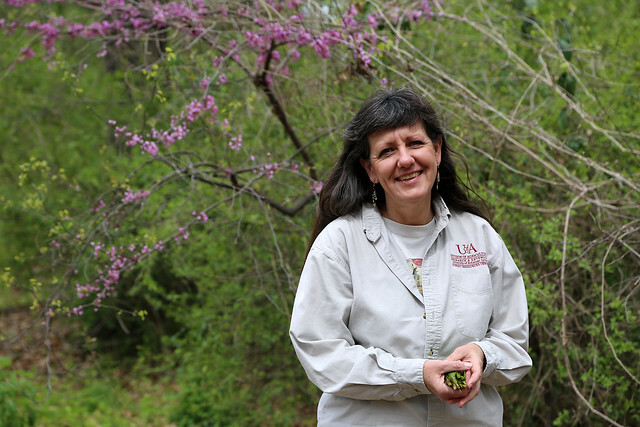 Walkingstick, associate director of the Arkansas Forest Resources Center of the University of Arkansas System Division of Agriculture, said she plans to start the session by taking the group on a hike around the woods near the visitors center. She’ll point out the wild edibles on the way, but there will be no picking. That’s not allowed in state parks. Along the way the group will learn to identify edible species of Arkansas native and non-native vegetation and concepts of conservation, history, culture and plant identification. Walkingstick will also bring 30 pages of wild edible recipes that the group will prepare when they return to the visitors center – using plants that she’s bringing from outside the park. “We get it all prepared and share little samples,” Walkingstick said. “Last week at Devil’s Den State Park we had Jerusalem artichoke peanut butter curry soup.” People attending the Hobbs workshop will need to wait and see what’s on the menu there. Walkingstick will bring toaster ovens but there will probably be only a couple of items that need to be baked. “We’ll do just normal recipes that we put wild things into like acorn scones or muscadine ice cream. And no bugs,” she said. Walkingstick began presenting these workshops 19 years ago when she offered the material as part of 4-H education sessions in plant identification. The sessions have since been expanded to inclusion in the Master Gardener program of the Cooperative Extension Service. The people who sign up for her workshops have a wide variety of backgrounds and interests and all are welcome to participate. For more information about forestry, contact your county extension office, or visit www.uaex.edu.